No science is more at the core of every technology that supports the seven billion people living on the planet today than chemistry. Chemistry is at the base of the foods, medicines, fuels and materials that are the hallmarks of modern life. 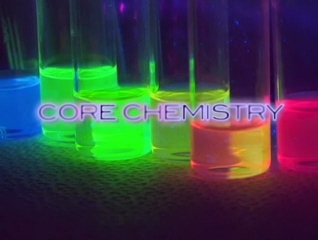 Core Chemistry presents how each branch of chemistry - physical chemistry, organic chemistry and biochemistry - evolved from a clear understanding of the principles and laws of chemical interactions. Chemistry brings good things to life. 00:06:28The study of began with ancient chemistry's use of charcoal the later with the discovery of gunpowder. 00:03:03Electrolysis, electricity and static electricity were studied by Luigi Galvanic and Volta, and using their results Wi9lliam Nickerson decomposed water into oxygen, hydrogen, the reverse of which is the fuel cell. 00:05:05Atoms and Atomic Theory started with, Robert Boyle and were further developed by John Dalton. 00:04:06Organic Chemistry is made up of carbon compounds that are polymers of nylon, polyester are two. 00:04:08The Periodic Table develop by Mendeleyev arranges atoms and elements in a precise order. 00:05:35Because of the chemical laws, catalysts, bio-catalysts and enzymes are needed to produce new chemical such as ethanol, all of which have led to pharmaceutical industry, biochemical industry and chemical engineering. Explore our inventory of Products, with Graphics, Details, and Filters & Searching. Quickly list and select from our entire inventory of Streaming Products. Our complete collection of DVD sales is still available.Choose this option to browse or purchase. Restricted to use by professors and students of a single campus. Discounts are available for volume purchases, multi-campus and consortium purchases, as well as multi-year purchases. Please call your sales representative for details. Institutional purchases will allow you, the purchaser, to view the programs and clips while logged into this site. You can also specify a list of allowed IP addresses or IP address ranges in your account settings. This will allow students and instructors to access your purchased videos via the Institution Access page without needing a login. Authentication happens automatically when our system recognizes an IP address from your institution. To allow off-campus access, you can include the IP addresses of proxy servers used by home users, similar to how access is configured to other online library journal database resources. Contact your sales representative for all multiple school/campus orders, multiple year, special orders designed to backend our system into yours, for content only transfers to your server, and Purchase Order approval. We are dedicated to providing your digital files the way you want them. If you don't see it, just ask!